← September is National Sewing Month! My son is crazy about mushrooms. Last year for Christmas he wanted a book titled Mushrooms of West Virginia and the Central Appalachians (of course he got it!). 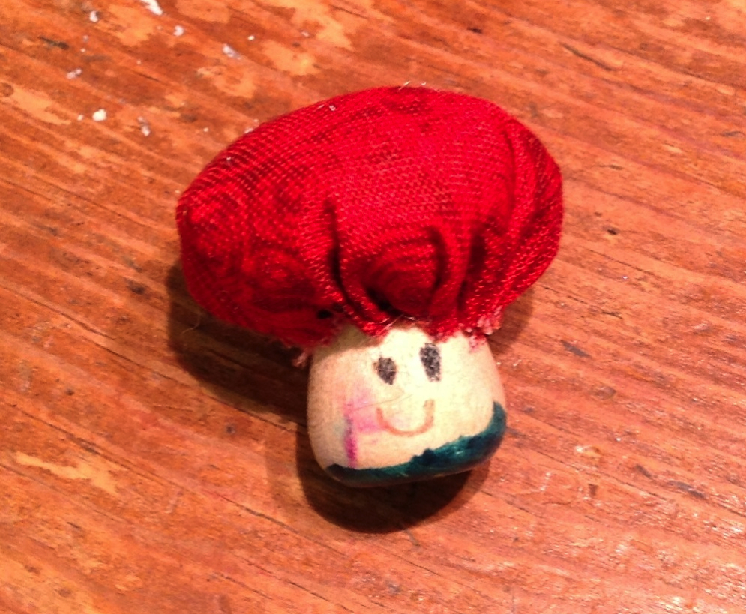 He came up with this fun little mushroom craft that requires very few supplies. He rooted through my scrap basket and selected about 11 different fabrics that looked like mushroom tops. Batiks work well for this, as do tone on tone prints. He also found that the reverse side of the fabric would sometimes work. Next, cut out a 2 1/2″ circle from each fabric scrap. Using a needle and thread, sew a running stitch about 1/3″ in from the edge. Gather the circle and add a small bit of stuffing. When making the first one (pictured above) we placed the wooden spool instead the gathered circle and pulled the thread tight, and tied it off. This was pretty awkward and too some time to get the thread tight enough. For the other ones, we gathered up the circle, stuffed it, tied it off, and then glued the “puff” on top of the wooden spool. That worked much better and was even cuter! Once the mushroom is dry, use a green marker to draw a bit of grass at the bottom. If you like, add a smiley face! I cut out a piece of green felt for the meadow and gave him a plastic Crystal Light container for storage. Viola! A portable mushroom meadow! 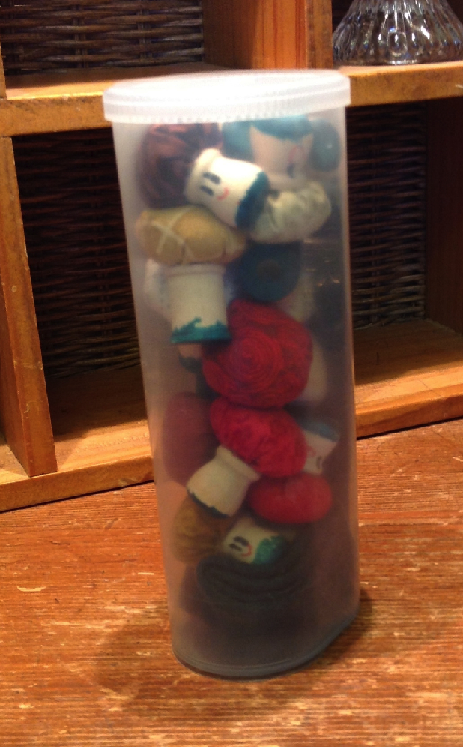 This entry was posted in Dolls and Softies, For Kids, Sewing, Stashbusters, Tutorials. Bookmark the permalink. With all of the mushrooms growing around, we are going to give this a go this week. Thanks for the great ideas! Thanks Juanita! Send me pics of any mushrooms you make.